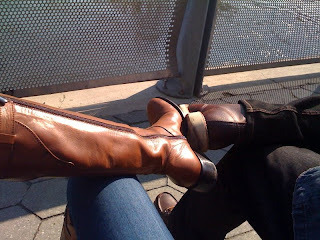 The other weekend we went to Queensboro bridge, the bridge that connects Long Island City in Queens with Manhattan. It's also called the 59th Street Bridge because on its Manhattan side it's located between 59th and 60th Streets. We wanted to see this bridge to recreate that iconic scene in Woody Allen's Manhattan. This shot is almost close. I don't think we'd go here at 5 am though. 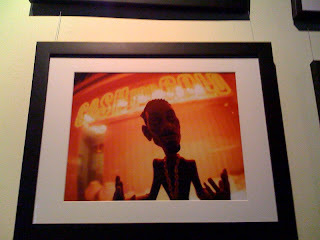 Maybe we'll go back at night and if we really wanted to be film nerds, we'd have Gershwin on our iPod. Love the opening credit to Taxi. We were sitting on a bench on the opposite side of the bridge so it wasn't quite the "Manhattan" scene but it was nonetheless a great view. On a day that's not too cold, this is a great place to bring a sandwich bag and just hang out. If you have a dog, it's even better because there's a nice dog park here; there were tons of dogs and their owners letting their dogs freely play with each other at the park. On our way down to this area, we were wondering why there were hundreds of dog poo everywhere. I love how Woody Allen described this wonderful place we're living in: "What I feel about New York is hard to say in a few words. It’s really the rhythm of the city. You feel it the moment you walk down the street. 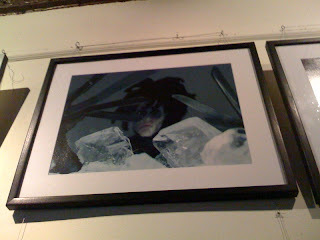 There’s hundreds of good restaurants, thousands of brilliant paintings, you see all the old movies, all the new ones. … It has to do with nerves, with the blood that runs through the city. It’s dangerous, noisy. It’s not peaceful or easy and because of it you feel more alive. It’s more in keeping with what human beings are meant to feel about the world. … There’s more conflict than anywhere else. The struggle to survive here is much more exciting than Los Angeles, say, where everything is pleasant. I mean, all those people sitting in their tubs, can you imagine it?" 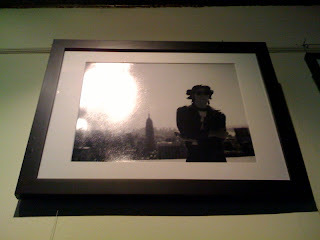 So those that love both Woody Allen's films and New York will love this article. 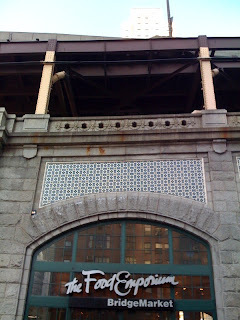 The Queensboro bridge's surrounding areas are pretty cool too. 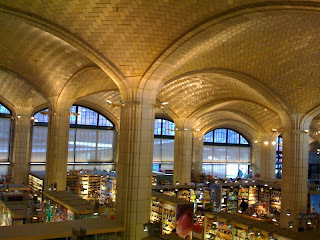 Right by the bridge is one of the fanciest and cleanest super markets we've been to - the Food Emporium Bridge Market. There's also a nice (expensive) furniture store called the Conran Shop right next to this market that sells some wonderful children's furnishings. 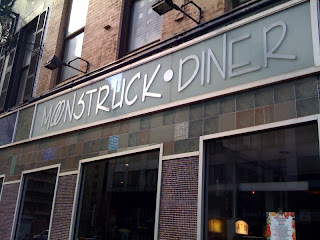 A diner named after one of our favorite movies. "Ma, I love him awful." 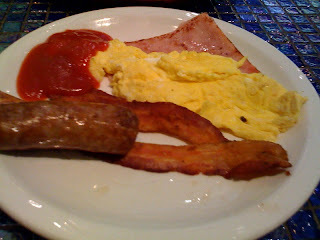 This plate of sausage, ham, bacon and eggs . . .
. . . plus this plate of dollar pancakes were only $15. 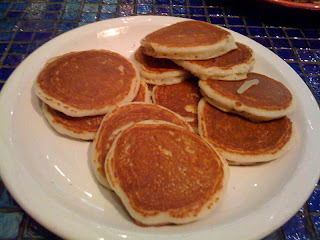 Eating the mini-sized pancakes are usually much more fun and easier to eat. 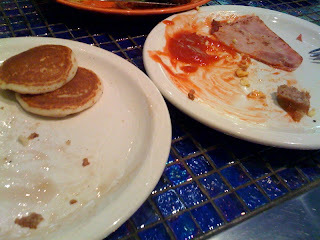 Our plates are cleared pretty fast. 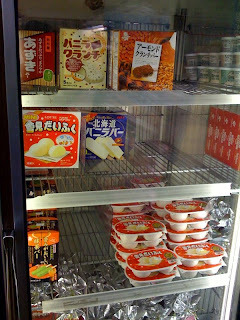 We've been looking for Japanese marts in this city. 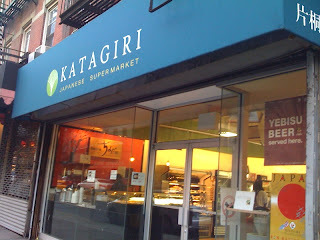 The only one we liked was in the East Village, which is actually more of a Korean mart than a Japanese mart, but we're glad we found Katagiri. One of our favorite ice creams. 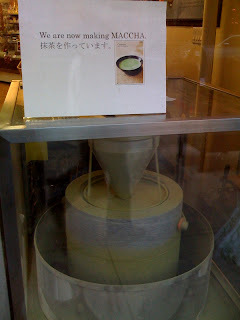 Green tea mochi ice cream! 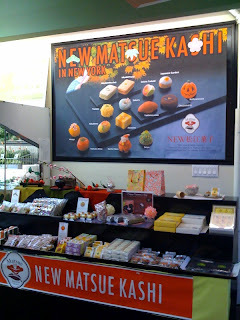 We also love Japaneses teas and drinks. We finally found the Ito En/Dr. Andrew Weil teas here. It's funny that we had to come all the way to New York to find it. 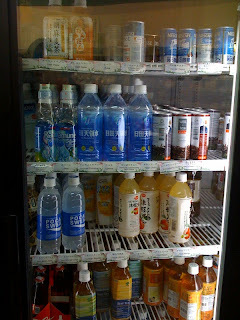 Although they had the green and white tea varieties, we are still in search of the Ito En/Dr. Weil's turmeric tea. 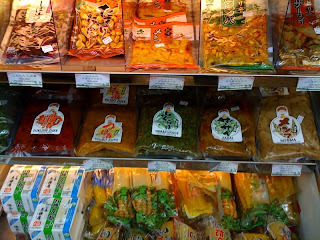 We love weird pickled Japanese food. We miss Shirokiya. 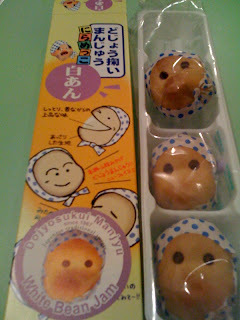 Japanese packaging is either really pretty and delicate or really strange. But we love strange so this works for us. And it was oishi! Is this the place where people go to silence their inner demons over a pint of Guinness? Perhaps. This Irish pub, after all, is named after the young patron saint of mental afflictions. It's a neighborhood pub on St. Mark's Place between Ave. A & 1st Ave. (and luckily not located on the the tourist trap/little Tokyo part of St. Mark's. This street and the surrounding streets have tons of great restaurants and shops). 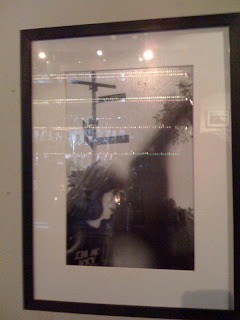 So if you read our Sunday blog below, you know we were in the East Village from day to night. 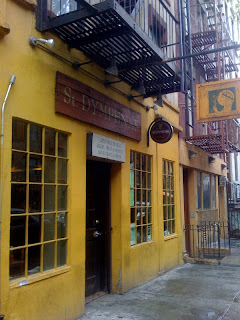 St. Dymphna's is where we started our excursion. St. Dymphna's doesn't seem like the standard Irish Pub. Yes, it's an Irish pub that sells Irish breakfast, Guinness, and has an Irish following. But it doesn't have cheesy Guinness light decorations or other "green" decor, and it didn't become an Irish pub by default by putting up dart boards or naming its bar with the "Mc . . . " or the "O' . 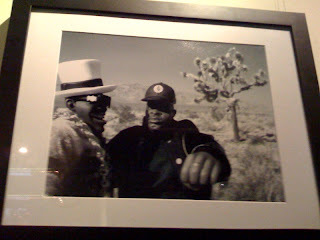 . . " monikers. It was quite a refreshingly different kind of pub, almost homely. The kind of pub you could take your grandmother to without feeling guilty. The front area was small and cozy. 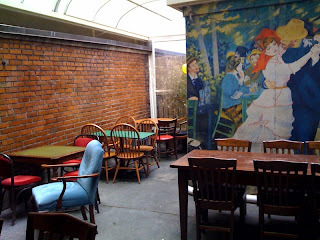 The back "garden area" was great, although no one wanted to sit there despite the heating lamps. 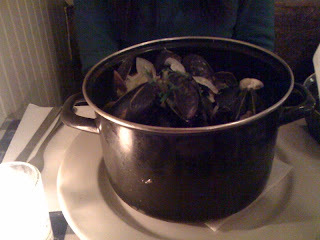 Just the night prior we were watching Bobby Flay's visit to Ireland. So we were craving a taste of Ireland ourselves. 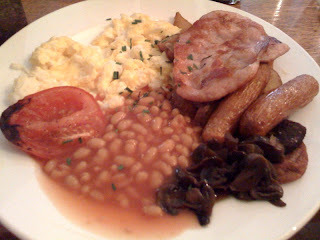 We had their Irish breakfast, which consisted of scrambled eggs, rasher, sausage, black and white pudding, beans, home fries, mushrooms, and tomatoes. It was good and hearty. Nothing outstanding but definitely satisfying. The sausages were good, the black and white pudding were delicious, and quite frankly the worst part of this meal were the mushrooms. 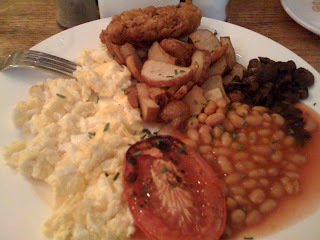 Their veggie breakfast was pretty much the same as the Irish breakfast without the meat - so you got eggs, veggie sausage, beans, home fries, mushrooms, and tomatoes. 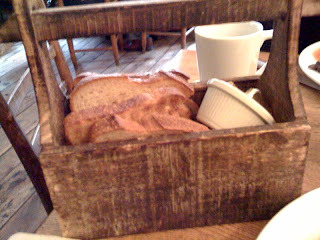 Toast somehow tastes better served in this rather than just on a plain white plate. This was a vinegary sauce that complemented the sausages nicely but went horridly with the eggs. 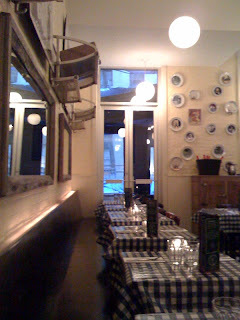 We ended our day (still in the East Village) at S'MAC on East 12th Street between 1st and 2nd Aves. 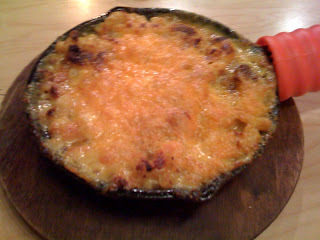 S'MAC (or Sarita's Macaroni & Cheese) only sells mac & cheese. You can even build your own mac & cheese or order it multi-grain or gluten free. You can also choose your size - ranging from the smallest "Nosh" to the largest "Partay!" 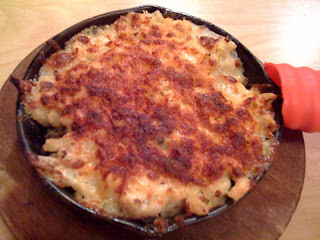 Or if you can't decide, you can opt for their S'MAC Sampler. We ordered the Nosh-sized Cheeseburger Mac & Cheese (cheddar, American cheeses with seasoned Ground Beef). The Nosh for $6.25 was plentiful for one adult. It was okay but way too oily. Really, it would have been better called oil and cheese. The Garden Lite Mac & Cheese (yes, sounds scary to me too) consists of lite cheddar, parmesan, roasted cauliflower and portobello mushrooms, roasted garlic, broccoli and scallions. 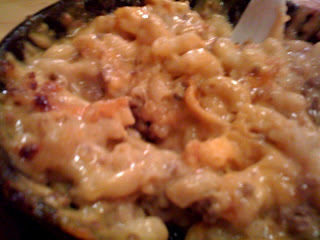 It ended up actually being better than the Cheeseburger Mac & Cheese because it wasn't swimming in a gross puddle of oil. We absolutely adore the idea of an all mac & cheese place (would have been my dream come true as a child), but we wouldn't go back there because it wasn't exceptional. The Inn's mac & cheese is still on top. With thousands of restaurants in this city, if it 'aint exceptional, we 'aint going back. But this would definitely be a fun place to take kids or do their mac & cheese party platters for the little ones. 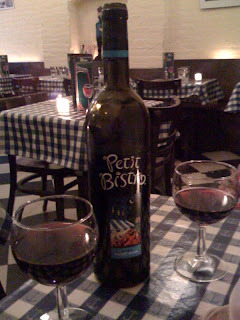 We spent about six hours wandering around the East Village today - finding new things, peering into the windows of restaurants and bars we might want to try, walking in and out of a million clothing stores with 60% off sale signs in the windows (most still beyond our budget), seeing cool murals on the walls we pass by, basically doing what we love doing in New York - letting ourselves get lost on its streets. 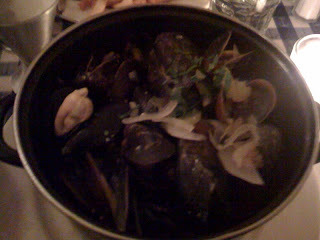 We started with brunch and ended with dinner (later posts). 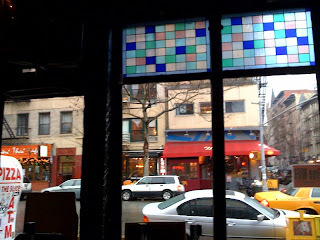 But on this cold and rainy day, we stopped by for an early happy hour at Niagara (facing Tompkins Square Park, on Avenue A at 7th Street). It's an iconic sort of East Village bar with its exterior mural of the legendary Joe Strummer. This mural's been repainted since our last visit to this mural. Guinness for just $3. Thank you happy hour! Guinness is always good. But there are those moments when it's just perfect. Today was one of those days. A lovely day for a Guinness. 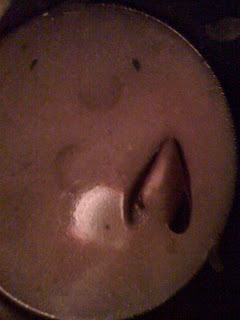 The perfect drink at the perfect bar at the perfect moment on a pretty perfectly melancholy day. It was so early (at 5:00 PM) that we were the only people there. And that's just how we wanted it. The bar is grand and has that throw back to the old days feel, though you're not quite certain why - perhaps the bumper sticker on the cash register "I Miss the Old New York" helps to make you feel like you're not at some new trendy bar, perhaps it's the sounds of Roy Orbison, perhaps its the mural of Joe Strummer on the other side of the wall that makes you think of what those ruckus days were like. 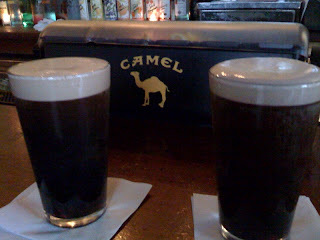 It was a perfect way to wrap up a wonderful day in the East Village. We can only imagine how insanely crowded and rowdy this bar gets late at night (they're open 'til 4:00 am), especially on Fridays and Saturdays. We would probably hate this bar on those nights. 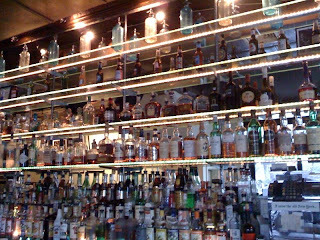 But today, this was selfishly and appropriately our bar. 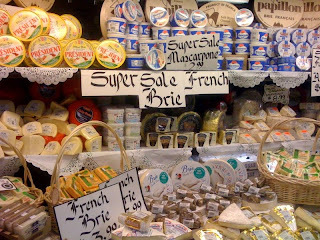 Our favorite cheese on sale for dirt cheap at our local market! A glorious late-night snack: Brie and crackers. By the time we took this photo, we had already eaten half the monstrous chunk. It was large enough to feed a village. 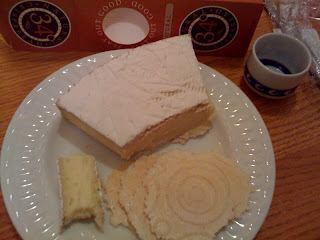 The best part, this huge chunk of 60% double cream brie cost us only $2.75. We loved that it wasn't too creamy, it wasn't too hard. These 34 degree Natural Crispbreads (available at Whole Foods) are the perfect companion to brie. As written on its box, it is indeed a most clever cracker - all natural crackers baked to thin crisp perfection. There's other flavors like Rosemary, but the plain "natural" one is the best one paired with cheese. Simplicity at its best. 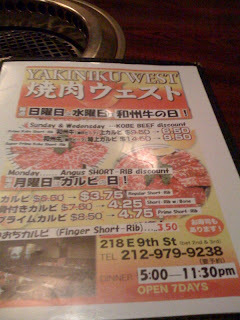 This past Monday we went to Yakiniku West in the East Village (on E 9th Street between 2nd and 3rd). 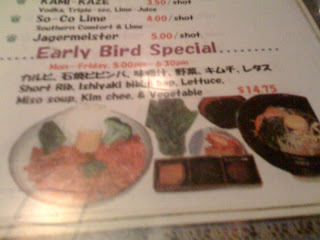 Luckily Monday was President's day holiday because Yakiniku West has some great early evening weekday specials. On Mondays through Fridays from only 5 to 6:30 pm, there's a great special: For $14.75 , you get meat which you cook on the grill, bibim bap, miso soup, and vegetables. 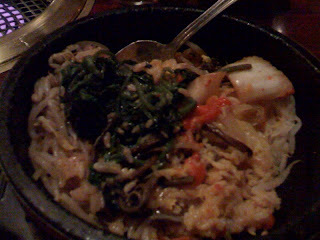 The bibimbap was served in a sizzling stone pot. Delicious and healthy. At first it didn't seem like they gave us a lot of meat. But after you've had the large pot of bibimbap, there's no way we could have had more. 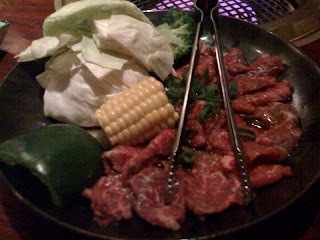 Carnivores like us drool a downpour when a plate like this is put fourth in front of us. 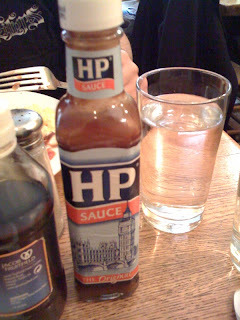 We also loved that they gave us sauce options so we could "mix and match" to our taste buds. And of course, the Korean style lettuce to wrap the meat inside. The food was fresh. 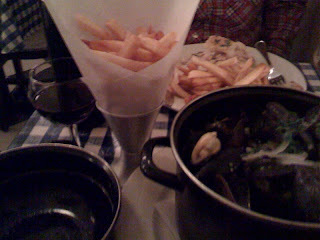 The portions were plentiful. 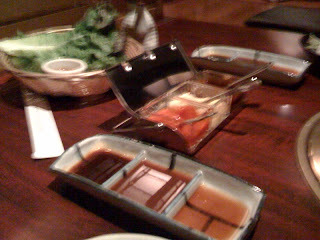 The service was good (the waiters were Japanese and the cooks were Mexican). 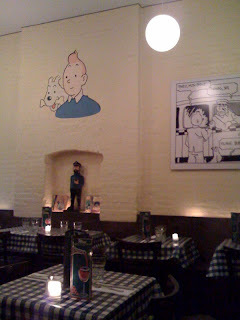 The restaurant was clean and traditional style (you have to take off you shoes at the door). And we love discounts (and we're not talking discounts on past expiration date food either). We were so full that our pants were unzipped (classy) and we were unable to wobble ourselves back to the subway (so we ended up blowing our money on a damn cab). (Side note: Winter months are great because you can hide your unzipped, belly-popping selves under your coat). We'd go back for their weekday specials. 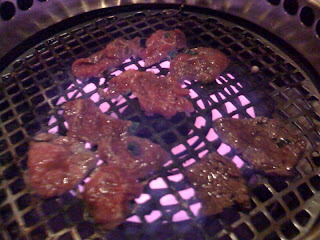 But Yakiniku West still doesn't top Yakiniku Camelia back home.